Paul Manafort goes through security as he arrives at federal court in Washington on Friday. 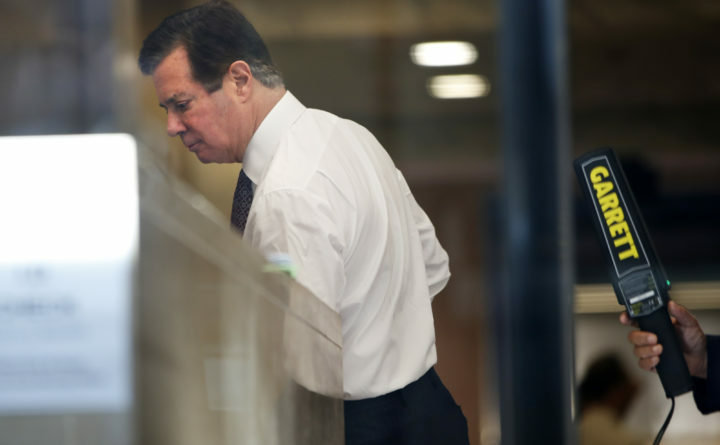 WASHINGTON — Onetime Trump campaign chairman Paul Manafort has been sent to jail after a federal judge revoked his house arrest over allegations of witness tampering in special counsel Robert Mueller’s Russia investigation. Manafort, 69, now loses the relative freedom he enjoyed while preparing for two criminal trials. He faces the possibility, if tried and convicted, of spending the rest of his life in prison. Still, it’s unclear whether the move will push Manafort to cooperate with prosecutors. Manafort witnessed several key episodes under investigation by Mueller’s team. But he has not shown a willingness to help investigators, maintaining his innocence and attacking his prosecution as illegitimate. Prosecutors have given no indication they are pursuing a plea deal or consider his testimony essential to the probe given the amount of evidence — and other cooperators — they’ve amassed in the last year. President Donald Trump criticized Jackson’s decision, even as he sought to distance himself from Manafort by saying the former chairman worked for other prominent Republicans and worked for his campaign for only “49 days or something? A very short period of time.” In fact, Manafort served there for nearly five months. Trump also tweeted with sarcasm that he “didn’t know Manafort was the head of the Mob” and asked: “What about Comey and Crooked Hillary and all of the others? Very unfair!” Those were references to James Comey, whom Trump fired as FBI director, and Hillary Clinton, the 2016 Democratic presidential nominee. The president incorrectly referred to Manafort’s pretrial detention as a “tough sentence.” Manafort hasn’t been convicted of any crimes or sentenced. Manafort pleaded not guilty to the latest indictment Friday. Kilimnik, who prosecutors say lives in Russia, did not appear in court or respond to an email seeking comment Friday. Mueller’s team has said that Kilimnik has ties to Russian intelligence agencies, a claim he has denied. Manafort’s lawyers have accused prosecutors of conjuring a “sinister plot” out of “innocuous” contacts. They filed a memo written by one of the witnesses for Manafort that his attorneys say shows the work of the group, known as the Hapsburg group, was European-focused. Manafort lawyer Richard Westling said his client had “largely” complied with Jackson’s orders. And he argued that Manafort could not have known the men he contacted were witnesses.